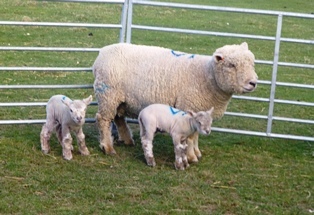 It’s lambing time here and lambs from the Nepcote flock of Southdown sheep can be seen in the fields in Findon village, where I live. I took my granddaughters to help bottle-feed one of the lambs, who was rather weak, and they were thrilled to sit with the little lamb on their laps. 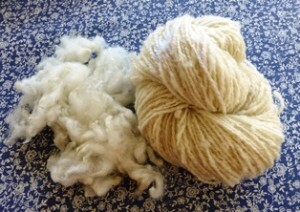 I have also been spinning a Southdown shearling fleece from the Nepcote flock. It has a reasonable staple length (about 4 to 5 cms), is soft and fine in texture and is producing a pleasing springy yarn. This fleece was one of three shorn recently from shearlings being prepared for showing later in the year, by which time they should have grown another lovely fleece just ready for the show. 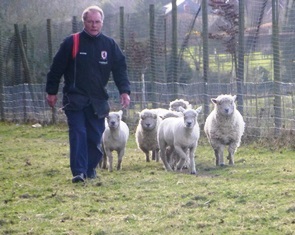 The photo below (taken early in the evening) shows Graham Langford, the co-owner of the sheep, followed by some of his shearlings, including those from which the fleeces came. When the rest of the flock is shorn in June I shall be looking out for more shearling fleeces.